Dr. A.R. 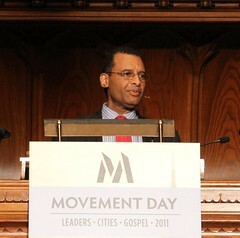 Bernard speaking at Movement Day in New York City. Dr. A.R. Bernard is pastor and CEO of the 35,000-member Christian Cultural Center (CCC) in Brooklyn, New York, but spent ten years as a banker before he and his wife, Karen, founded the church 33 years ago. Bernard was a keynote speaker at Movement Day, a New York City conference designed to accelerate gospel movements in America’s cities. While Dr. Tim Keller, pastor New York’s Redeemer Presbyterian Church, talked about the injustice of ignoring the needs of the poor, and Erwin McManus, pastor of Mosaic in Los Angeles, talked about the “spaces between us,” Bernard focused on how to build an institution and about “sanctifying” the customer service policies of American Express and Disney World. People sometimes have negative perceptions of institutions, but “when creativity, innovation, and faith keep that organization alive and on the cutting edge, an institution becomes an entity that preserves not just history, but a record of progression,” he said. 4. strength beyond the presence of any one individual. “What one person begins, it takes a team of people to continue,” he added. Dr. A.R. Bernard talking to an attendee at Movement Day. This is where American Express and Disney World customer service training come in. Bernard met with the American Express chief executive officer over marketing and customer service development in 1990 to glean principles that he could “sanctify” for ministry. The executive was so taken aback that a church was interested in customer service that she gave Bernard a copy of the company’s training manual, with the caveat that Bernard wouldn’t pass it to AmEx competitors. “This was an awakening for many people. It really helped them to understand the difference between task and purpose because too many of them, without the proper training, become task oriented,” Bernard said. For example, an usher whose task is to seat a person would defeat his or her purpose by treating parishioners rudely. “They’ve achieved their task, but failed in achieving their purpose, if the purpose is to make people feel warm and welcome,” he explained. After a decade of using the AmEx model, Bernard looked to Disney for guidance, even taking 1,000 staff members to the entertainment giant’s training center in Florida for a staff retreat. That’s why CCC invests in both staff and volunteer development. When UrbanFaith talked to Bernard during a break, he said he met with resistance when he first adopted customer service principles at CCC. He looked to Moses as a biblical model for institutional leadership, he said. Bernard also talked about creating a home away from home for parishioners so that the emotional experience they have at church is a positive one. “When people come to your church or whatever it is, your establishment that you are building for God, they leave with an emotional experience. If you don’t intentionally determine what that experience is going to be, then chances are great that it’s going to be negative and that will be the last time they come there. Environment is more than just a place that you gather to; it’s what you experience when you’re in that place,” he told the Movement Day audience. So why not make the place they go to experience God their home away from home? Bernard asked. For Christian Cultural Center members, that home away from home grew from a storefront church into an 11.5 acre campus that is a catalyst for redemptive change in its community. And one man’s bold vision for “sanctifying” the skills he learned as a banker helped get it there. Thank God for the Anointing and Brilliance that Dr. A. R. Bernard brings to the Body of Christ and the world. It is my sincere prayer that you have written a book on this subject. If you have not done so let me be among the first to say that we need this work in print!